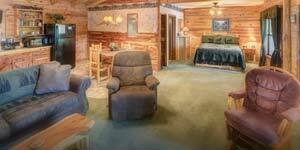 All accommodations at Lake Shore Cabins provide visitors all the comforts of home, from your linens to your dishes. Just bring your family, clothes & toiletries, and food! In addition to our luxury Eureka Springs cabin rentals, there’s also a small grocery store on site, and private chefs are available to cook for you in your cabin. Learn more about adding to your stay on our In Room Services page. All accommodations include a Jacuzzi tub or free standing soaking tub, fireplace, full kitchens, SAT TV/DVD/VCR/CD player, Wifi and BBQ grills. Hike the trail down to the waterfront OR drive down and park. At the water enjoy the boat dock, swimming, fishing and sun deck. Onsite you’ll also find nature trails, picnic areas, horseshoe pit, laundry facility, grocery store, gallery and gift shop.